The North Carolina Coastal Federation staff and volunteers were pleased to act as Avalon Pier’s zone captain for the Outer Banks Surfrider Foundation’s annual OBX Beach Sweep and TrashFest on Sept. 22. Both locals and visitors gathered at multiple accesses to remove trash from the beach. While the sweep had been planned far in advance, it proved to be exceptionally productive following the arrival of Hurricane Florence earlier in the week. Other organizations including Surf Pediatrics and Medicine, the North Carolina Aquarium at Roanoke Island, Jennette’s Pier, Kitty Hawk Kayaks, the Network for Endangered Sea Turtles (N.E.S.T.) and the Girl Scouts of America served as zone captains at additional accesses to ensure full coverage of the beach. Supplies were coordinated by the Surfrider Foundation’s Outer Banks chapter. Grain bags from the Outer Banks Brewing Station were used as trash bags, providing an example of creative repurposing and recycling. Cigarette butts, typically the most found trash item on the beach, were collected separately at several zones to be sent to Terracycle, a recycling service that produces plastic pallets, benches and more from the collected cigarette butts. Plastic straws were also collected separately at several zones to be used in art projects highlighting single-use plastic usage. The collected trash was counted and tallied using the Ocean Conservancy’s data card for beach cleanups into categories like plastic dining utensils, plastic bags, fishing gear, aluminum cans and more. This data collection is important for better understanding marine debris and its sources for both solutions and prevention. The data is currently being compiled and the results will be shared later. Participants gathered at the Outer Banks Brewing Station following the cleanup for Trashfest, where pizza, tacos and drinks were provided. 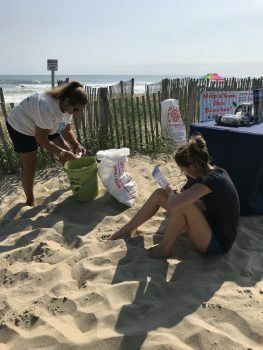 Live music and outreach materials were available such as metal straws, reusable tote bags and t-shirts to cap the event off and celebrate a trash free Outer Banks.